At first I read that opponent could skip my drawing, but the second time I read it again and I'm pretty impressed. Providing you can filter your draws (preordain, ponder, brainstorm, jace, top... even delver) this card reads: each turn draw a card or throw a bolt to opponent's face, when bolt could easily be 5 if you reveal fow or gush (not to speak dtt or love boat). Besides it's a 3/2 with menace, which means that it trades with golem and it's not easy to block. Playable? Comparison with mentor is not positive, but most creatures are worse than mentor and however some fit into winning decks. Against prison I'd prefer this, same if I'm hellbent. Also against oath, since this is unblockable and can win life race (if that is possible against a griselbrand). It also allows staying on 2 colors. Puts too much control in your opponents hands. If you are mana screwed any mana will go to your graveyard free of charge. If you are good on mana or even have too much, any mana goes to your hand. It does help burn thru your deck. But if your opponent has say a mentor on the board is he going to take 1 to the face to make you lose lightning bolt or you let you have bolt? For that matter even if his board is empty he'll take the 1 to the face to get rid of lightning bolt. He's a 3/2 for 3 that puts your card pool into your opponents hands. This upkeep effect is besides your draw, right? I mean, you are drawing the next card anyway, opponent can pay life to put this card in your graveyard or just go to your hand. If it's a land I think the decision is pretty clear, but if you already paid for this creature, you are not supposed to have troubles with mana. Same cost, browbeat does more the same turn it's played, but on the long run Prodder seems better. But i don't find them really comparable. So to play this optimally you want your average CMC to be as high as possible to ensure you draw an extra card, or get a good burn spell every turn. Your opponent is always going to bin 0 CMCs. Spirit Guides, Gush, Force, Chewer and any other card with an alternative mode seems good with it. In general, it seems like an interesting card, and I commend anyone who finds a way to make it work. Don't forget delve spells. In fact that does not ensure lot of direct damage, but a good amount of extra cards. Easier said than done, I don't really expect this to be played, but it's really interesting. I would be happy if half my top draws go to my hand (spells) and half go to grave (lands), because I'll be keeping the quality. 15 years ago (before internet ruined my life) I had a beautiful Pyromancy deck. It started with mana flare, pyroclasm, aether flash, and then I filled it with big fatties. One day I discovered Pyromancy and fell in love: fry all creatures in play until I could play pyromancy and finish opponent in a couple of turns. I wonder if I could find a place for pyromancy nowadays, haven't thought about that card for years. Not that bob is really tearing up the charts anymore, but I find it crazy that people could swear by Bob yet not give this the time of day. If you know what you are doing this guys is almost always pure upside. If you reveal a non 0 cost card then it is either CA or Free damage, and if you reveal a 0 and they bin it you got something in the yard for free to pay for your delve. In a R/U control shell this seems viable to me. Maybe along side Jori en, maxing out of topdeck fixers, and playing a bunch of control, maybe more so than usual. This is Bob, except it blanks every time you flip mana or a good card. That's not good. And costs 3 mana... and doesn't cost you life... I love comparisons of cards that are worlds different. I don't think this card is pure upside. First off, it costs you a card and 2R for a 3/2 Menace. That's not objectively terrible, but spending that much mana and a card is potentially downside all by itself. "At the beginning of your upkeep, your opponent Fateseals 1. If the opponent puts the card the bottom of your library, put it into the graveyard and he or she loses life equal to its casting cost. If the opponent leaves the card on top, put that card into your hand." So, yes, you are trading one random card on top for another. Sure. But, your enemy is getting to Fateseal every other card. Kind of. You get past the card either way, and you won't lose your regular draw step. They can't stop you from drawing your card normally, no. But, they can influence your draws by kicking away any critical cards coming up. In a deck with silver bullets or tutors, this gets potentially more serious. If your opponent is mill Lightning Bolts in a burn deck, then that's gravy; this guy acts a lot like Pyrostatic Pillar on-a-stick (the name escapes me). But in a Vintage deck, I think the free Fateseal is actually kind of problematic. It could be useful for a Gifts list? Use cards like Accumulated Knowledge? Gush, Force, Thirst? Jace, Misdirection, Dack etc. three damage plus the threat of a 3 damage menace is not horrible. Card draw or a decent clock. Opponent can see half the card on top, just as confidant. Confidant allows getting all, this only half (rounding), but this allows burn in your face, confidant damages yourself (which is often relevant). Confidant puts a 10 turn clock, prodder 7 at most, probably 5 seems more reasonable. 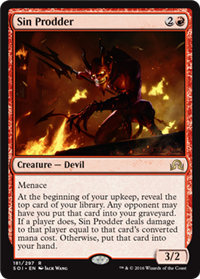 Confidant is killed by *any* creature or token, Prodder must be blocked by at least 2, trades with more creatures. Another random comparison (sorry Lance) is Keranos: every turn you draw or bolt. Prodder can do both: draw a card and then attack for 3. Yes, keranos is indestructible, prodder is not. Prodder has to connect, card drawing is optional... Well, it's not comparable at all. @MaximumCDawg: If you are playing silver bullets, this is not your card. if you cannot manipulate what you are drawing, this is not your card. If 1 damage here, 2 damage there does nothing for you, this is not your card.